Does your loyalty lie with the Stark, Greyjoy, Baratheon, Lannister or Targaryen family? It’s a question that fans of the popular HBO series, “Game of Thrones” can answer without hesitation. But is your loyalty steadfast? Dedicated enough to make a permanent pledge on your body? To promote the April 2 premiere of season two of “Game of Thrones,” HBO put fan loyalty to the test with “Pledge Your Allegiance,” a Facebook app that allowed fans to preview five videos -- one for each family -- and pledge their loyalty prior to the premiere. For fans that felt the need to pledge devotion to their favorite House of Westeros in a more permanent way, NY-based agency Campfire invited fans on March 30 to get inked by a famous tattoo artist with their favorite family’s “sigil” (insignia) for free. 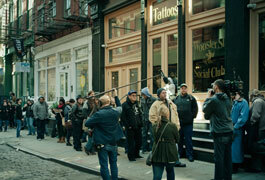 The one-day event took place from noon to 8 p.m. at the Wooster Street Social Club, home to tattoo artist Ami James, star of TLC’s “NY Ink.” James tattooed five fans -- one tattoo for each family. The rest of the team took up the slack until 50 fans total received complimentary tattoos. Consolation prizes for fans who waited in line but did not get a free tattoo: they were given temporary tattoos of the varying family sigils. “Designs were based on HBO production designs, of the sigils seen in the show: the direwolf, the three-headed dragon, the lion, the kraken and the stag,” said Steve Coulson, Partner/Creative Director at Campfire. The event was promoted predominantly through social media, including the “Game of Thrones” Facebook and Twitter pages. This campaign reminds me of "The Social Tattoo Project," created last year by a trio of BBH Barn interns who asked Twitter users what topics were important to them and found volunteers to have symbols of the winning causes tattooed on them. The winning tattoos were a cresting wave for Japan, handcuffed hands for human trafficking, a broken heart for Haiti, a pie chart for poverty and a flower flag for Norway.